What is a Server-Hosted Workstation with GVT? Simply put, a GVT server-hosted workstation is a single card workstation — referred to as a cartridge or sled — containing an Intel Xeon processor with Intel Iris Pro or HD Graphics, plus system RAM and a hard drive (or solid state disk) for storage. Figure 1. 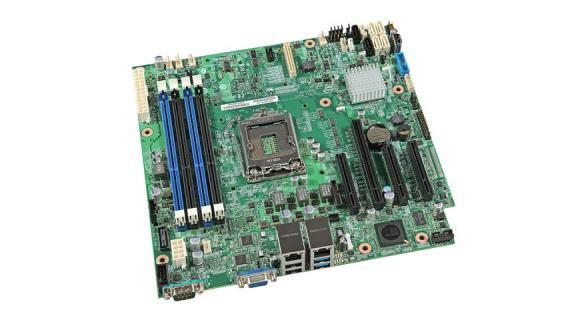 The Intel Server Board S1200V3RPO. Image courtesy of Intel. These GVT workstation cartridges or slides are plugged into a rack-mounted case that provides power and connections to your company’s network infrastructure. Then, depending on the manufacturer of the cartridge/rack system, anywhere from 12 to 45 cards can fit in a single 3U- to 5U-server. Figure 2. Depending on the side of the system, you can house up to 45 cartridges in a GVT server-hosted workstation system. Image courtesy of Intel. From there, users can “see” the remote workstation cartridge from their tablet, laptop, or remotely located workstation using a Citrix Receiver, much like using any remote desktop sharing tool. The CAD software then runs on the server cartridge (which utilizes the Windows Server operating system) in conjunction with Citrix XenDesktop and HDX 3D Pro software. The result is a highly compressed, low latency stream of full motion 3D graphics being sent to the user while keyboard/mouse instructions are received from the user. Since only screen and mouse data is being transmitted very little network bandwidth is required even for large scale CAD projects. Multiplatform support of CAD software: Citrix technology allows your CAD software to run on the hosted-server while the user controls it from an inexpensive tablet or a consumer PC that normally would not be able to run CAD effectively. (This is an extremely powerful benefit for supporting traveling workers. Bypassing WAN bandwidth restrictions. CAD users in branch offices often experience extreme delays when attempting to load large model files over a WAN or Internet connections. In the server-hosted workstation topology, the model and the workstation are in the same data center using 1 GBit or higher speed network connections and high speed on-workstation storage to speed load and processing times. For applications such as Autodesk’s Revit that performs frequent project update polling that can bring WAN installations to a crawl, this is a particularly compelling benefit. Preservation of network resources. Because CAD models aren’t opened across a WAN connection, server-hosted workstations can actually reduce total WAN traffic. Single location convenience. Because all workstation cartridges reside in a single data center using Windows Server, IT personnel can easily maintain user workstations without having to travel. Consistent workstation configurations. Each workstation cartridge has the same components, software drivers, and graphics hardware making administration of multiple workstations much easier than dealing with dispersed, dissimilar workstations. Security. Because the workstation cartridges reside inside the data center, they are just as safe from fire, natural disaster, and theft as all other assets. Data safety. Because the workstation cartridges are centralized, IT can assure everything on them is properly backed up. Given the potentially compelling benefits of the approach, it seems like companies would already be running their CAD applications on server-hosted workstations, yet they aren’t. Many industries such as banking/finance, medical records, and reservations have used virtual workstation technology for years, so why have CAD users resisted the concept? To be honest, until now the workstation cartridges available simply weren't up to the task. CAD users don’t run low power, low resolution graphics applications, so while prior generations of low power, server-hosted computing devices have proven some benefits, they haven’t had the power to run the CAD applications properly. These specifications actually exceed many standalone workstations in today’s market — particularly when configured with high speed solid state disks (SSD). These specs are adequate to run all but the most aggressive CAD/rendering applications well. The CAD user experience. Will remote CAD applications “feel” right to CAD users who’ve always had their own low-latency workstation on their own desktop? IT impact. What to buy? How to integrate the devices? How to define ongoing IT support requirements? These will all be key questions to answer. Cost impact and ROI. Will server-hosted workstations save your company money when all factors are considered? In upcoming installments we'll examine these questions in detail as we continue to investigate the feasibility of server-hosted workstations. How could this approach change the way you used and support CAD? Start to think about your company’s environment and come back next week for more discussion. Until next time. Robert Green performs CAD programming and consulting throughout the United States and Canada. He is the author of Expert CAD Management: The Complete Guide. Reach him via his web site, www.cad-manager.com.